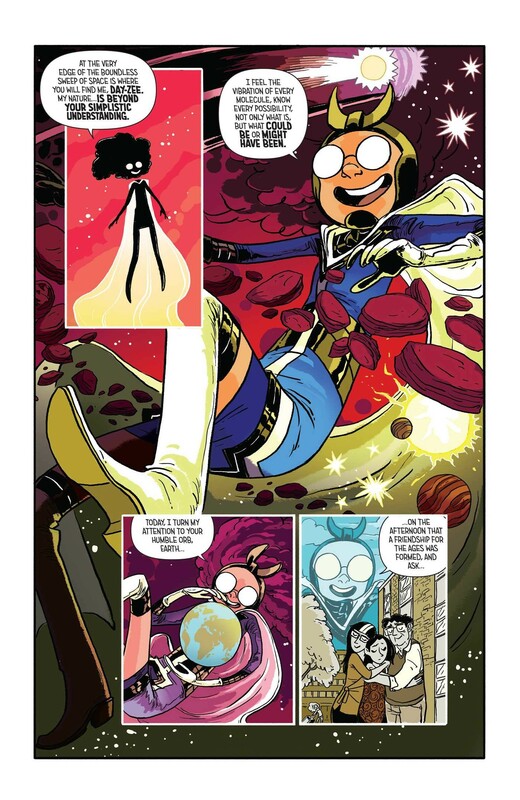 Collects the Giant Days 2016 & 2017 Holiday Specials and the material featured only in the BOOM! Box 2015 & 2016 Mix Tapes. Result! But given that all sounds rather prosaic considering the madcap merriment contained within, let's throw the story titles out there for your titillation: 'What Would Have Happened If Esther, Daisy & Susan Hadn't Become Friends (And It Was Christmas)? ', the back-up strip 'How The Fishman Despoiled Christmas' and 'Love? Ack, Shelly!' all penned John and illustrated by various artists. Plus three shorts written and drawn by the man himself, featuring the intrepid reporter Shelly Winters: 'Fridge Raider', 'Music Is Important' and 'Destroy History'. In fact, Shelly Winters also co-stars in one of the main stories as Esther, Susan and Daisy head down to London for a festive visit to stay with Shelly and Ester takes it upon herself to sort out Shelly's tangled love life... Given what a car crash De Groot is in the romance stakes herself, should she really actually be playing matchmaker or can she actually somehow manage spark up a romance, or two, for Winters? The other main story opens proceedings, and it is a classic What If? yarn, including an all-seeing, all-knowing cosmic Daisy depicted as The Watcher seeing how John's alternative take on the girls first days at Uni would have panned out if they hadn't hit it off instantly and become first friends. 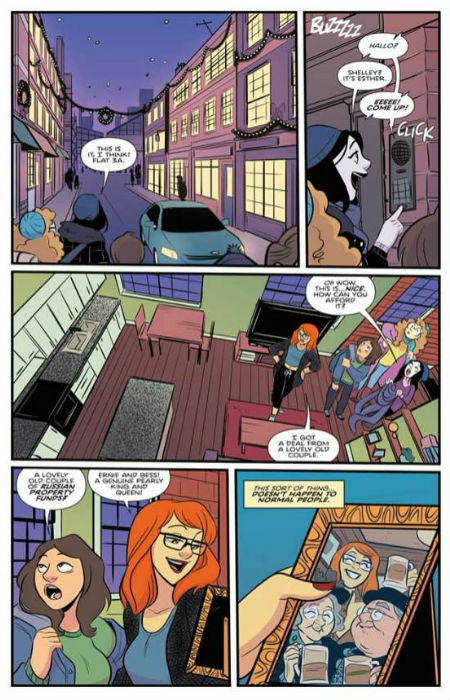 If you've been picking up GIANT DAYS in trades, make sure you don't miss out on this bonus material. It should be on everyone's required reading list, as should All Things John Allison! 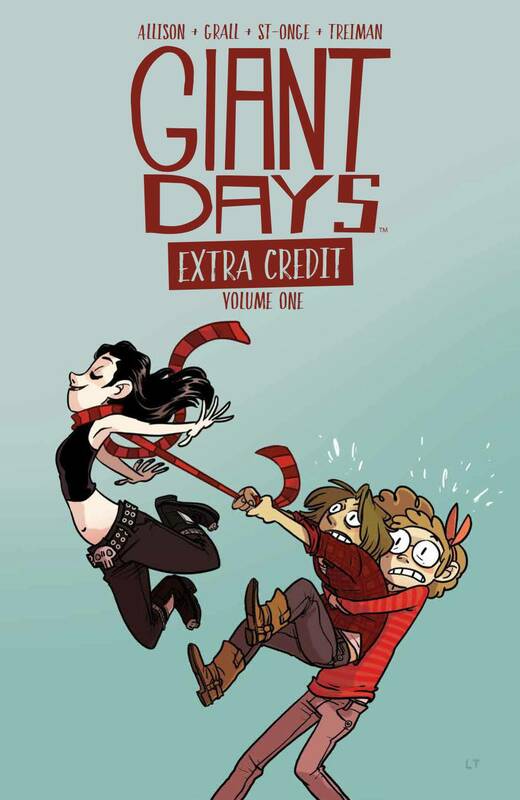 Also, please, please note: this does not contain the additional GIANT DAYS 3-ISSUE SELF-PUBLISHED MINI-SERIES drawn by John Allison himself which has never been collected in book form. Fortunately Page 45 has complete sets for sale. It's like we're in love, or something.